To late. Republican policies are responsible for some 90% of the national debt. I do feel the need to shed a little light on this comment as it is a common urban myth on the left side of the street. 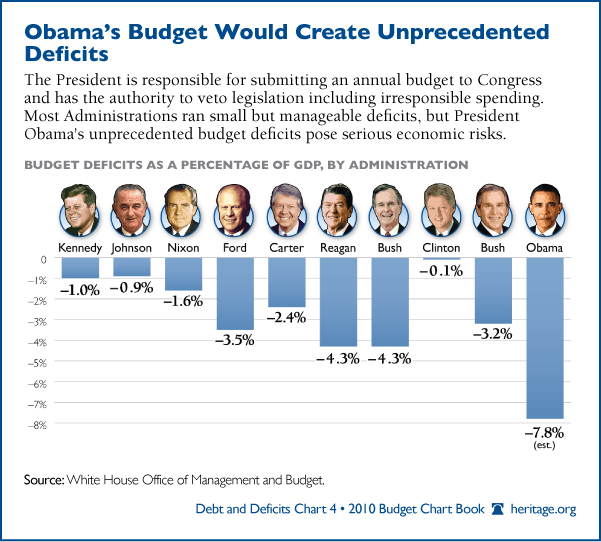 Fact 1: the Obama administration is running the largest deficts as a percentage of GDP in history. Fact 2: The Obama Administration has proposed deficts which will take the National debt to levels never seen in modern history. Now, I am in no way defending the spending practices of the Bush administration and the republican congress which failed to show fiscal control while in power. If you read my post I clearly say that eliminating spending such as the F35 Alternate Engine is a test of credibility of Republicans in Congress. The American people sent a message to Republicans in November 2010 at the very moment they handed the majority in the House to the GOP; act responsibly or we will fire you again and find someone who will. At the same time the Liberal Left cannot come to terms with the reality that their tax and spend policies creat out of control deficits; its in their DNA. But the leftist myth that Republicans have created the majority of the debt is BUSTED. How do you figure it’s busted? Reagan tripled the debt, Bush Jr. doubled it. We’re paying 1/2 trillion dollars now just on interest on the debt. The current huge deficits are mainly the result of reduced revenues from high unemployment, increased payouts for unemployment benefits, and the Bush/Obama tax cuts. 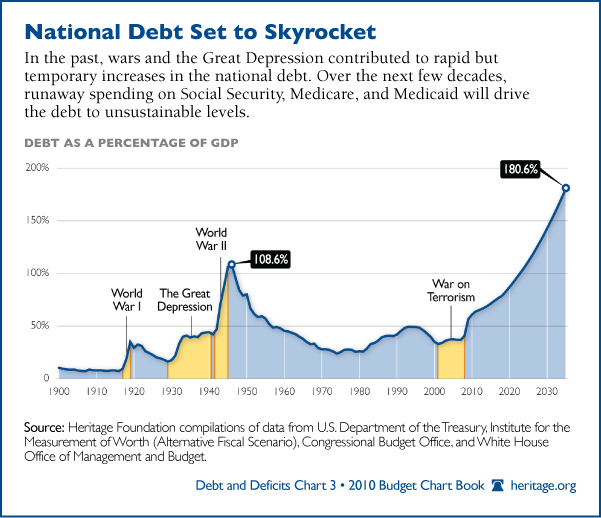 Obama is guilty of not fighting to let the Bush tax cuts expire and adding even more tax cuts, but the debt IS primarily due to conservative policies. A man after my own heart – using Heritage materials. You should also check out “Slay the Beast” by Bill Beach and Rob Bluey. It’s geared toward young professionals, but it’s got some great facts and figures on entitlements.